An A Cappella Quintet. Over the past four decades, Peking and the Mystics has toured nationally and internationally (including trips to the Far East and South America), recorded three CDs, appeared on television and radio, and been featured in local and national print media. 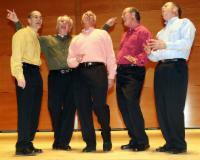 The group’s eclectic a cappella repertoire incorporates swing, jazz, doo-wop, and pop music of every decade from the 1890s to the 2000s. They’ve even had the honor of singing the national anthem at Fenway Park. Complimentary refreshments.